4D Theatron™ is Simuline’s total 4D theater package that includes 4D motion chairs, true 3D surround sound, and cinema quality projection. Our motion chairs have several unique, built-in effects that provide a truly immersive 4D experience. We have partnered with various leading cinema projector brands and also with Sonic Tier Audio, developers of state-of-the-art 30.2 channel 3D sound. 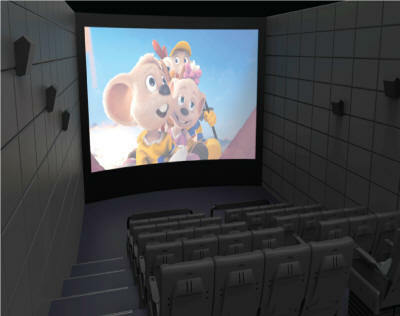 4D Theatron™ can be configured for any sized space, from small-scale attraction theaters to full 500+ seat halls. In anything from precise motion control to dynamic motion changes, our electric motion base units show incredible performance and durability. 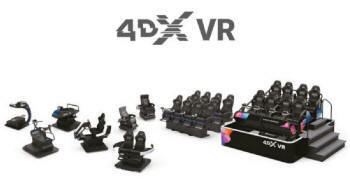 4DX VR products can be coordinated with any kinds of VR content: for game & entertainment content, short films and promotional movie trailers in VR format. Combining virtual reality with the dynamic motion creates the most amazing ride experience ever. Perfectly synchronized motion effects with the actions and movements in the VR content will give a genuine sensation of “reality”. Simulates the motion of 5 DOF simulator with 3 DOF motion system! - One of the Simuline's best sellers! - Marketed globally through SEGA!! - Un-Compromised safety features! - Seat belt, emergency stop, proximity sensor, floor sensor and etc. - Loaded with SEGA's best selling software - Initial D, F-Zero, Club Kart! - Network Play for up to 8 players! - Sold More than 300 units globally! Ultimate Inverted 6DOF Motion Experience!! - Simuliune's Inverted motion system is protected by a World Wide Patent!! - Blows away the conventional motion simulators with unreal motion!! - Makes any ride film an extreme motion ride experience!! - Crystal clear 60" wide screen PDP!! - Can be installed in both indoor and outdoor location!! - Attractive cabin design attracts crowd!! - Various ride films including : Race Cars, Roller Coasters, Tunnel ride and many many more!! - 6 seats for Family Fun!! - 4D effects including wind, vibration and more extends the motion ride experience to the limit!! 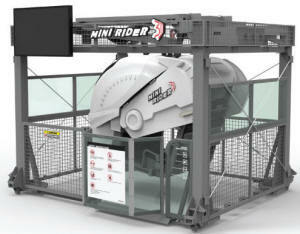 The Mini Rider 3D is a coin-operable two seat rider system that incorporates our proprietary 3 axis inverted motion system. The complete package includes several passenger selectable ride films that have been optimized to the Mini Rider. Installation is quick and the attractive design is sure to be an attention grabber. 5DOF motion with 3DOF motion system!! - A Best Seller from the Best Company in Motion Simulator business!! - Crystal Clear 42" PDP screen!! - Semi-open Cabin that attracts more crowd!! - Easy Installation and Re-Location!! - 4D effects to maximize the ride experience!! - Received numerous praises from many international trade shows!! - Sold hundreds of units all over the world!! - Satisfies world's safety standards!! - Simuline's Patented "inverted Motion System"
- Certifications include UL (ARL), CE, PSE, FCC, EK, ADIPS and etc!! Dynamic Motion from Simuline's Electric 6DOF motion System. - 4D Effect package including wind, snow, bubble, and many more! - Huge ride film library! - Turns any ride film into an extreme ride experience! - Can be made to order! - Various 4D effects including Water Shot, Wind, Heat storm, lightening, Vibration, and many many more! - Safety features to keep the passengers and your business safe! 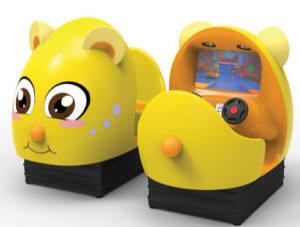 TurboToons™ is a brand new, coin-operable children’s motion rider system that offers a safe and fun ride for all children. Designed to stand out from other kiddie riders, TurboToons™ comes equipped with a large 24” screen, motion that matches the on-screen action. TurboToons™ is all the fun of Simuline’s thrill rides in a kid sized package. The Valkyrie is an interactive 4D motion ride that combines Simuline’s immersive 6 DOF motion platform with cutting edge interactive content based on the award winning Unreal game engine. 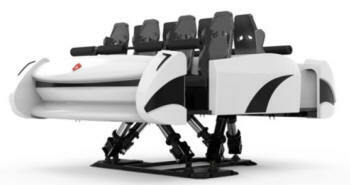 A total 8 players ride on either side of the Valkyrie. Valkyrie’s dual screens show the content from different perspectives, allowing for more replay value. VRcade creates an all-in-one system that delivers an interactive experience that is second to none. 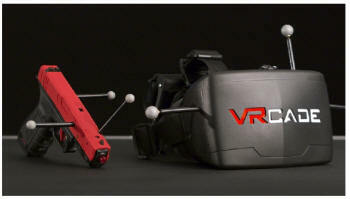 By combining the latest advancements in immersive head mounted displays, motion capture systems, and real-time 3D engines, VRcade systems deliver a high fidelity, low-latency experience that makes the VRcade Gridspace a 3D human interface with limitless potential. - Loaded with 4D special effects - Wind, Snow, Bubble, etc. - Turns any ride films into an extreme ride experience! - HD movies on a large scale silver screen! - Roller coaster ride, tunnel ride, and many many more! - Sold and installed in 15 countries! - Easy maintenance electric motion system! - Can be installed indoor and outdoor!